In the bowl of a food processor fitted with mixing/chopping blade, add all ingredients for the herb crust. Pulse until bread is in fine crumbs, and herbs and garlic are very finely chopped. Place the meat, bone side down, in a baking pan. Sprinkle with salt and pepper, and rub all over with Dijon mustard. Cover roast evenly with breadcrumbs mixture. Place pan in the oven and roast meat for 20 minutes, then reduce oven temperature to 300°F. Roast until meat reaches an internal temperature of 125°F for medium rare, about 2 hours total. Allow roast to rest while making mustard cream sauce. Do not cover the meat while it rests. In a small saucepan, heat white wine, shallot and salt over medium heat until simmering. Cook for 2 minutes. Whisk in cream and mustard. Simmer until mixture has thickened to a sauce consistency, 6-7 minutes. 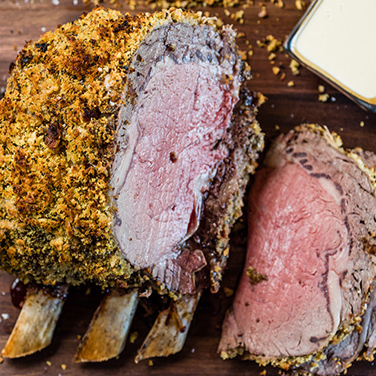 Slice roast and serve with mustard cream sauce.